An injectable hydrogel could aid recovery from brain injury by helping stimulate tissue growth at the site of the wound, researchers say. The gel has been developed by Dr Ning Zhang at Clemson University, South Carolina, who presented her work to a conference on military health research. She predicted the gel may be ready for human testing in about three years. Following a brain injury the tissues tend to swell up and this causes the loss of even more cells, compounding the damage caused by the original wound. The standard treatments attempt to minimise this secondary damage at the site of the injury, for instance by lowering the temperature or relieving the build up of pressure. However, their impact is often limited. 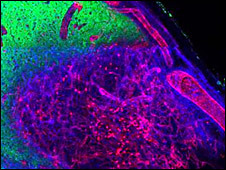 Scientists believe that transplanting donor brain cells into the wound to repair tissue damage is potentially a more productive approach. But while this method has had some success in treating some central nervous system diseases, it has produced very limited results when used to treat brain injuries. The donor cells do not tend to thrive at the site of injury, or to stimulate repair. This could be due to inflammation and scarring at the injury site, and the lack of supportive tissue and blood supply to provide the necessary nutrients. Researchers say the advantage of the new gel, which is injected into the injury in liquid form, is that it can be loaded with different chemicals to stimulate various biological processes. First, Dr Zhang used it to help re-establish a full blood supply at the site of a brain injury in rats, potentially providing a much more friendly environment for donor cells to thrive. Then, in follow-up work, she loaded it with immature human stem cells and the chemicals they need to develop into fully fledged adult brain cells. After eight weeks of treatment with this mixture rats with severe brain injuries showed signs of making a significant recovery. Dr Zhang, whose work is funded by the US Department of Defense, said: "We have seen an increase in brain injuries due to combat, but our strategy can also potentially be applied to head injuries caused by car accidents, falls and gunshot wounds." She said the gel could potentially be loaded with different factors to make it useful for patients at varying stages following injury. Professor James Fawcett, of the Cambridge University Centre for Brain Repair, said a brain-compatible gel that could inhibit scar formation and prevent the release of toxic molecules following brain injury would be a significant advance. Headway, the brain injury association, said the research looked very interesting and could potentially be a "significant step foward". But in a statement, the charity said: "It is important to remember, however, that no human trials have taken place at this stage and a great deal more research is required before this method of regenerating brain tissue following traumatic injury can be heralded. "We are some years away from the possible therapeutic use of this gel and it is important the expectations of people with brain injury are managed to avoid promises of miracle cures."